We manage to squeeze in a last minute trip to Edinburgh Quilt Show last weekend. We didn't leave Bridlington till well after 6pm and drove up into the night. 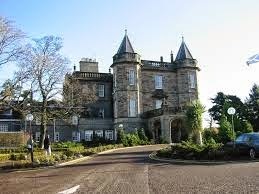 We arrived at our hotel, Marriot Dalmahoy well after midnight. We had intended to try the Premier Inn, but as the clock ticked over past midnight their system would not let us make the reservation for that evening. The next morning we headed to the show and managed to park close to the entrance. The show was much smaller than Harrogate and there was only a competition for journal quilts and an exhibition of quilts by several quilters, plus trade stands & cafe. These are by Jeanette Orr. Stars in the night....A Jacqueline de Jonge BeColouful pattern. ..oh so excited Jacqueline is here with us next week teaching a four day retreat. After a quick cuppa in the cafe, we drove over to Irvine for the main reason of our trip - a friends wedding. For her wedding present Jacqui requested a quilt. I knew she LOVES purple and thats what I thought I was going to make, but its a really good job that I asked as she requested browns & creams and a square design. Here is what I made her. We drove back on Monday and later that day the happy couple got round to opening their presents. I'm really relieved to say that they both love the quilt & took to facebook to announce their joy.